Measurement technology requirements? Order your standard dial thermometers easily and directly from us - with the WIKA quality you are accustomed to. Bimetal temperature gauges operate with a measuring system in the form of a helical or spiral tube. The measuring system consists of two sheets with different expansion coefficients, which are inseparably joined. The mechanical deformation of the bimetal strips into the tube shapes mentioned above results in a rotational movement, caused by temperature changes. If one end of the bimetal measuring system is firmly clamped, the other end will rotate the pointer shaft. Bimetal temperature gauges are available with a scale range of -70 ... +600 °C in accuracy classes 1 and 2 in accordance with EN 13190. An expansion temperature gauge consists of a temperature sensor, a capillary and a Bourdon tube. The measuring system itself is filled with a liquid. If the temperature changes, the internal pressure of the thermometer will change as well. 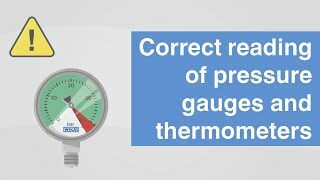 The pressure is transferred via a tube to a pointer shaft and thus the temperature value is indicated on the scale. Using capillaries from 500 to 10,000 mm long, measurements can also be taken from remote measuring points. The scale ranges for expansion temperature gauges lie between -40 ... +400 ° C with class 1 and 2 accuracies in accordance with EN 13190. With a gas-actuated temperature gauge the stem, the capillary and the Bourdon tube are joined together into one unit. The instrument is filled with inert gas. If the temperature changes, the internal pressure will also change. The pointer is moved by the action of the pressure via a measuring tube. To compensate for the ambient temperature, a bimetal element is mounted between the movement and the measuring tube. Gas-actuated temperature gauges are available with scale ranges between -200 ... +700 °C in accuracy class 1. These temperature gauges are suitable for the monitoring of temperatures in gases, vapours and liquids in vessels and pipelines. The thermometer is housed in a case with a cutout for the scale display. Machine glass thermometers are often used with a V-shaped case. 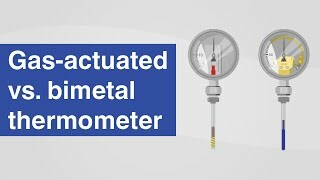 Bimetal vs. gas-actuated thermometers | What is the difference?